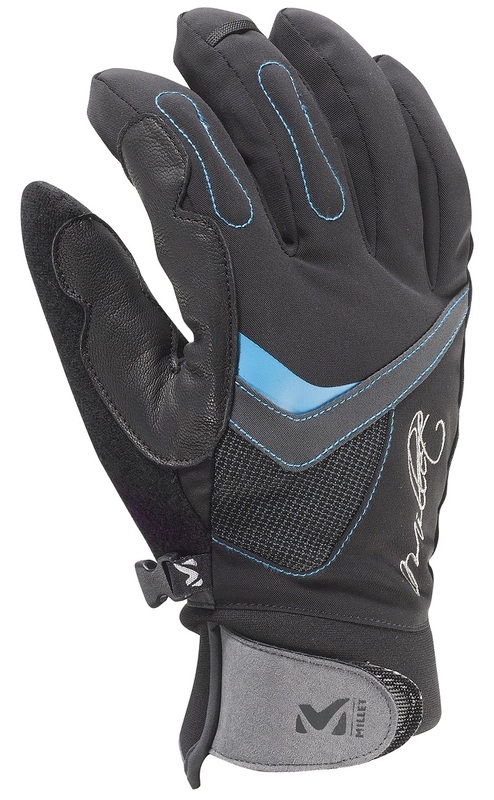 A warm, protective glove for modern ski touring. The Millet Touring Training Glove is built with female ergonomics to be precise so you can operate your bindings, skins, and other mountain gear. The glove has a waterproof, breathable insert so your hands won’t be frozen if you playing in the snow. Grip pads on each finger are perfect for holding poles or an ice axe. The Neoprene wrist cuffs have a Velcro tab for easy on/off. The inner glove features a soft anti-bacterial lining that prevents the bacteria/stink build-up. The Millet Touring Training glove is a reliable companion for up and downhill skiing. DRYEDGE™ membrane stops water from reaching your hands, but breathes. Durable Clarino Goat skin leather palm has is coated with silicon for extra grip. Light Hyperloft™ insulation is the right amount for ski touring in the winter. Durable Amazon Stretch DWR keeps moisture on the surface by beading. Terry fabric on the thumb is soft to wipe your goggles, glasses, or face. Warm and stretchy Neoprene cuff is secured by a quick-rip Velcro tab. Bemberg Polygiene® lining keeps things pleasant on the interior.